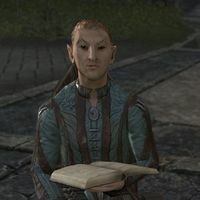 Adamir is a Bosmer member of the Mages Guild found in the city of Marbruk. As you approach him, he'll murmur to himself: "We've got almost everything." Talk to him. "Aha. A guest! How wonderful! I wonder, would you help my friend and I with a little experiment?" "We are reconstructing animals! Dead one, of course. Wouldn't do such a thing to live ones. That would be barbaric, not to mention impractical. Specifically, we are creating an elixir that will cause small dead animals to wriggle about as if alive"
And you wanted my help? "Well, as it turns out, we're fresh out of parts. Rat parts, I mean. I need you to bring us the head, legs, body, and tail from four different rats, so we can combine them into an animated rodent assemblage." "Oh I know, the whole thing seems rather rash and improbable, doesn't it. But our methods bring results. Bring back the rat parts, and we'll have a little rodent scurrying about in no time. Why, it will be almost lifelike!" You don't talk like a typical Bosmer. "There is a reason for this. One I would prefer to forget. It involves an early experiment with my associate. An experiment that failed horribly. It is not as simple as you may assume, however. When the two of us are involved, nothing is ever simple." Well, I'll bring the parts to you here. "No! No, please meet us outside the Fighters Guild. We must set up our experiment there." Gather the rat parts and meet him there. "Everything is here. Wonderful. Allow me a moment to apply our elixir …." "Now, we address the practical applications of this marvelous elixir! If you will help us one last time, I will increase your compensation." What do you mean by practical applications? What do you need me to do? "My associate and I have a mischievous nature. It is through this nature we show our affection for our friends. Our close friend Khalima is, as Timiwe would say, "a grumpy bug." We want to lift her spirits." How will a reanimated rat lift your friend's spirits? "Place these squirmy, rodent-things in her backpack, in the corner. She'll be back shortly and then we'll see the fruits of our labor! Timiwe and I have a wager. He expects her to double over with laughter. I, well, I do not expect that reaction." "The second stage is the most important. What use is magical inquiry if it cannot foster relationships?" It's done. When will you know the results? "Excellent! Here's your payment. I expect our dear friend will be back any moment. So, if you would like to stick around, it's sure to be an entertaining spectacle." Watch Khalima's horrified reaction after the quest is completed. If you talk to Adamir after this, he says, "Excellent. Well done. A fantastic experiment, if I do say so myself." This page was last modified on 7 March 2019, at 11:57.